For many decades, the best risk-adjusted returns were found using a multi-asset class investing approach. Historically this discipline, used by most of the top performing large foundations and endowments, enabled investors to achieve equity-like returns with far less risk and far less downside in difficult markets. A once-in-a-generation credit bubble and subsequent crisis altered the way these asset classes worked together. Due to record low interest rates, low inflation, and the U.S. dollar appreciating by over 30%, the number of asset classes that are performing near their long-term norms has dwindled to one – U.S. equities. The side effect of this is too many investors have piled into a single asset class, leaving many others trading at extremely compelling levels. The “piling” is reaching a crescendo as many of the reasons for the outperformance (low valuation, high earnings growth, low inflation, strong dollar) appear close to reversing. 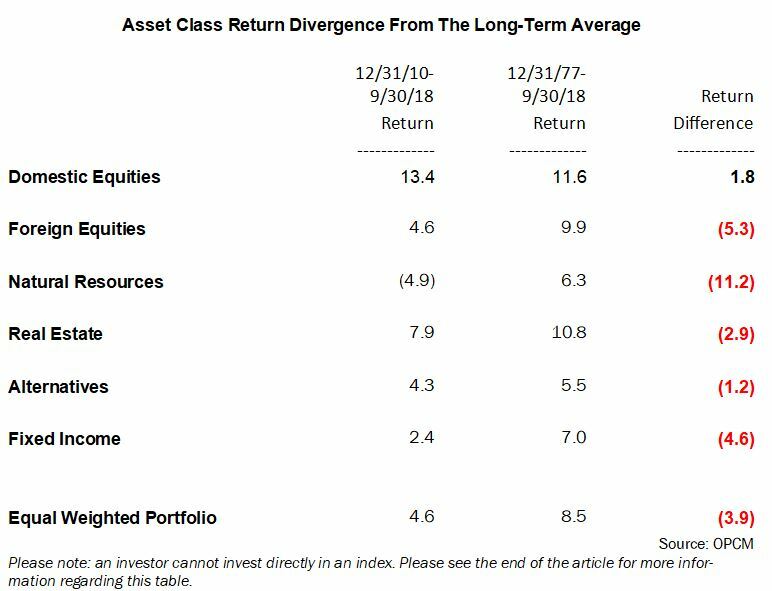 As seen in the table below, since 2010, domestic equities have strongly outperformed their long-term average annual return. Conversely, every other asset class has underperformed the long-term average – by a substantial margin in some cases. 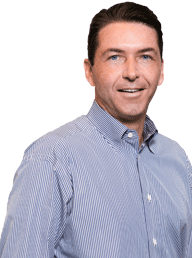 Generally the transition for one asset class to outperform another progresses in three stages. First, the difference in returns becomes extreme. Next, the valuation differential dramatically widens. Finally, the fundamentals reverse. Let’s examine how close the different asset classes are to achieving all three of these stages versus U.S. equities. First by almost any measure, the return of U.S. equities versus all other asset classes has reached at least a decade extreme. The performance difference with natural resources is basically unprecedented. U.S. equities typically outperform natural resources by about 5% a year (while natural resources trounce the U.S. in inflationary and weak dollar periods). However, since 2010 U.S. equities have outperformed by over 18% per year. Next, for many decades, U.S. and foreign equities both returned about 10% annually with one outperforming the other during stretches. Since 2010 the U.S. has outperformed foreign by almost 9% per year! The chart below shows the returns over the last 20 years. While at the end of 2007, foreign equities had outperformed the U.S. by over 100% in the previous five years, the U.S. has now outperformed foreign equities by over 70% during the last five years. These extremes in each direction usually reverse when the performance spread becomes too compelling for astute investors like today. Second, we analyze the relative valuation of other asset classes versus U.S. equities. The following table shows the long-term valuation range between foreign equities, emerging markets equities, REITs, and fixed income versus the S&P 500. While the relative valuation between fixed income and REITs versus the S&P 500 is essentially at fair value, huge extremes are seen within foreign equities and natural resources. To summarize the table, foreign equities as a whole trade at a P/E on next 12-months of earnings of 0.72x versus the U.S. – meaning a 28% discount (1.00-0.72). They are within 10% of reaching a long-term relative valuation low. The same phenomenon is seen with emerging markets. Natural resources are affected by the dollar and inflation. As the table shows, the dollar strength is within 10% of the high of 104. Once the dollar stops rising, natural resources experience a tailwind. Looking at REITs and fixed income, the opportunities are not as strong on a relative valuation basis. This is one of the reasons we are generally underweight both of these asset classes. Finally, a look at fundamentals. Clearly the U.S. earnings growth rate has been superior to other regions and asset classes recently. However, as U.S. interest rates continue to rise, inflation moves higher, and the earnings comparisons become difficult in 2019, investors could piece together these metrics, along with relative returns and relative valuation, and decide the risk/reward is superior in other asset classes. The above table shows the revenue, net income, and earnings growth rates for the S&P 500 from 2016 through estimated 2019. The non-existent earnings growth of 2016, gave way to 12% growth in 2017, then this year’s spike to up 22%. However, the table indicates the first quarter of 2018 was the growth peak at an unsustainable 26.6%. The fourth quarter will be the third quarter in a row of slower, but strong, earnings growth. 2019’s earnings growth estimate is now under 10%, which puts the S&P 500 earnings growth on par with the 10% estimate for foreign equities, and less than the 12% growth estimate for emerging markets. If these growth rates come to fruition, foreign equities trading at a little over 12x earnings are positioned well to potentially outperform the S&P 500 trading over 17x earnings. With a major performance extreme in place, along with a major relative valuation disconnect, and fundamentals beginning to turn in favor of other asset classes, many investors will learn the perpetual lesson of why investing in one asset class, or majorly overweighting an asset class can be dangerous, especially at valuation and performance extremes. In the OPCM Performance Comparison Table, (page 2) the following benchmarks are used to represent each asset class: Fixed Income – Barclays US Aggregate Bond Index (1977-1999), Barclays US Govt/Credit Interm Bond Index (2000-2018); Domestic Equities – S&P 500; Foreign Equities – MSCI EAFE (1977-2000), MSCI World ACWI ex US (2001-2018); Natural Resources – GSCI (1977-1991), Bloomberg Commodity (1992-2018); Real Estate – NAREIT (1977-2004), NAREIT Global (2005-2018); Alternatives – Hennessee Market Hedge Fund Index (1987-1999), HFRI Fund Weighted Index (2000-2007), HFRI Asset Weighted Index (2008-2018). The Equal Weighted Portfolio represents a hypothetical portfolio equally weighted in each asset class of the corresponding benchmark.